The Samsung Galaxy S III and Note II are both based on the Exynos 4412 Quad chipset, but in the Note II it has been slightly overclocked. Inside the chipset are four Cortex-A9 cores (running at 1.4GHz in the S III and 1.6GHz in the Note II), 1GB or 2GB of RAM and Mali-400MP GPU. The Galaxy S III situation is a little confusing - the international version of the S III has 1GB, while the LTE and US versions have 2GB. The US version is based on a different chipset too - a dual-core Snapdragon. We're reviewing the international S III, meaning Exynos with 1GB of RAM. It's running Android 4.1.1 Jelly Bean (which posted lower scores in some tests than ICS). Cortex-A9 isn't the newest ARM design in town, but it holds its own in single-threaded performance. Due to the clock speed, we expect to see a 15% advantage for the Note II, which is pretty much what we're seeing in Benchmark Pi. The Krait-packing LG Optimus G has a slight lead, but not by much. Linpack shows good performance for a quad-core A9, but it's way behind the four Kraits in this test. Still, the Exynos chipsets do beat the other popular quad A9 design, the Tegra 3. Geekbench 2 rates both Galaxy droids on top (over even the Optimus G). AnTuTu and Quadrant both give close scores to the S III and Note II, with an advantage for the faster CPU (of course). The GPU is a Mali-400, which Samsung used in the Galaxy S II and the original Note, but the one in the S III and Note II is a more powerful version. It holds up surprisingly well against the brand new Adreno 320 and easily beats the ULP GeForce GPU of the Tegra 3. Since the GPU is hitting the 60fps limitation of the screens when running NenaMark 2, we stuck with GLBenchmark. When rendering at 720p resolution, both GPUs are very close and not far from the Adreno 320. The lead on the Tegra 3 chipsets is around 50%. Ramped up to 1080p resolution however, things change - the new Adreno pulls ahead (followed closely by the triple-core SGX543 GPU in the Apple iPhone 5), while the Galaxy S III and Note II are still close together, but render at nearly half the framerate. Now for web browsing - both Galaxy droids are running Jelly Bean, which brought major speed improvements in this area. 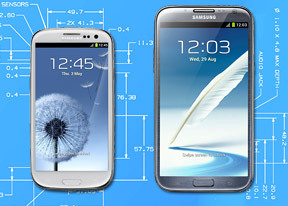 The Galaxy Note II is the fastest droid we've tested on SunSpider, just behind the iPhone 5. The Galaxy S III didn't break the 1000ms barrier, but is still quite impressive. In BrowserMark, the Note II is again the fastest droid phone we've tested and very close to the iPhone 5. The Galaxy S III is behind but manages to fend off other droids (with the exception of the Meizu MX 4-core, which shares its chipset with the Samsung phones). Finally, the Note II posts an impressive Vellamo score, while the Galaxy S III lags behind its bigger brother and also gives way to the HTC One X.